One of my favourite Thai dishes in the world is pad krapow gai, or Chicken stir fried with holy basil and garlic. Pork does it for me too, and I think you could do a truly wonderful version sans meat, with some melt in the mouth aubergine (I would go for the lighter coloured, slender Japanese variety). The Italian herb is ubiquitous these days, and more recently, it is possible to get the Greek version with the smaller leaves pretty easily. Harder to obtain is Thai Basil which usually defaults to the sweet variety. 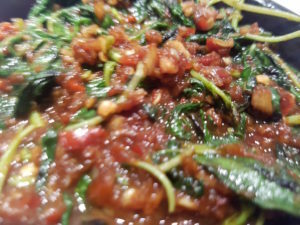 This really adds a wonderful extra layer flavour to your Thai curries! Far, far more elusive is holy basil! This is the very same variety of basil, native to India, known as tulsi, used by Hindus for their prayer. It is revered as the elixir of life, and is also consumed for medicinal purposes. In the UK it is very hard to find, and indeed I have purchased it before and have been very disappointed that find it certainly was not what it purported to be! 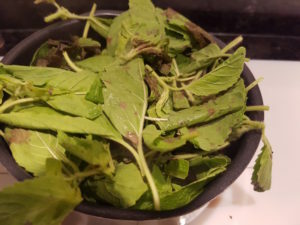 You see, holy basil, the real deal, really is very special: it has a much sturdier plant than its Italian cousin, and its flavour withstands heat much better too. 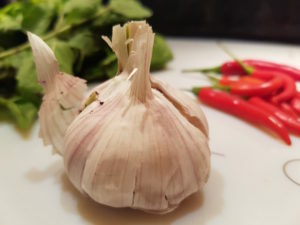 Its flavour has strong notes of liquorice and aniseed, and these aromatics that float and dance above the hot and spicy, savoury and sweet base of the sauce make the krapow sing! It’s a relatively simple dish, but to do well and get the balance right is hard! 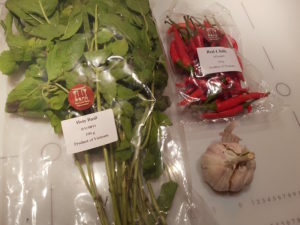 So just the other day, I found a big bunch of the stuff in Chinatown, and I excitedly and greedily added it to my basket, alongside its fellow krapow friends: garlic, red chillis, dark soy, Thai oyster sauce and of course, fish sauce (nam pla). I had a quandary though: these precious leaves don’t last very long in my experience. I also know what I am like: I get over-excited about a particularly culinary expedition. I then summarily forget until weeks later when I have to fish out a science experiment gone wrong! So what to do, dear reader? What indeed? Well, help was actually at hand in the shop. I kept on bumping into a lovely and very helpful Thai lady who helped me purchase her favourite brands of krapow ingredients as I went through the shop. 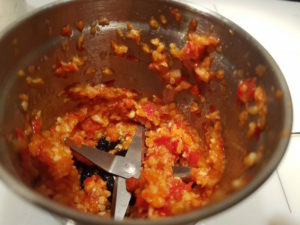 She suggested I could cook off the holy basil with some garlic and chilli and then freeze this proto sauce and put it to use another day. So here is my attempt at doing this. The logic being I can defrost this and create a lovely krapow by adding oyster sauce, additional seasonings (fish sauce and soy sauce) and meat later. Here are the main stars of the show! Blitz them in a chopper or food processor, adding some fish sauce and soy sauce to lubricate and aid the process, as well as adding some amazing flavour! Now add this to a small saucepan. Wow, that smell is pure Thailand. You’ve got to love it! Pack in the basil to the pan. I know it looks like a ridiculously disproportionate amount of basil, but it wilts down, and the dish really calls for this much! 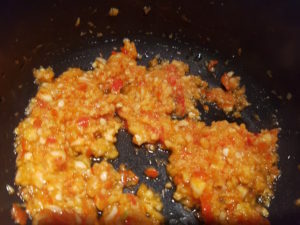 The finished sauce, ready to be frozen and then reconstituted another day! My guess is that we have a portion for four here, thinking that half a bag of basil would probably be the right amount for 2 people. Enjoy!